If you are reading this, chances are that you or a loved one have a problem with drinking. If you or someone you know has recently made a decision to stop drinking, you have arrived at the right place. It could be that you are unsure whether drinking has become a problem in your life. The basic definition of an alcoholic taken from the book Alcoholics Anonymous is “a physical compulsion to drink coupled with a mental obsession.” If you have found that you are unable to stop drinking entirely on your own, even with the desire present, you could have a problem with alcohol. A person does not have to be classified as an alcoholic to have an issue with drinking. Is drinking causing a problem in your life and in your relationships? Many men have crossed the line from social drinkers to problem drinkers to alcoholics. However, with alcohol addiction treatment it is possible to overcome problems with drinking and alcoholism. Actually putting a name on what type of drinker you are is not nearly as important as recognizing that you wish to put the drink down, but cannot. Have you ever found yourself unable to say “no” to drinking for any length of time, when you find yourself staring at the bottom of an empty glass thinking “how did this happen?” This could signify that drinking is causing a problem in your life. At His House we know that willpower is powerless when it comes to combating a drinking problem. There is no match for alcohol other than treatment. Alcoholism is a chronic disease of the mind, body, and spirit. The reasons behind not being able to successfully abandon the drink on your own is not a reflection of your character or inner strength. In fact, problem drinkers and alcoholics are hands-down some of the smartest, kindest, and smartest people that we know. Treatment is an essential part of addressing the problems associated with alcohol. 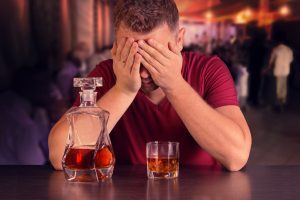 The safe parameters of our men’s alcohol detox program will provide you with excellent care and superb medical attention. The withdrawal symptoms from alcohol can vary in severity, so our patients are closely monitored by our highly trained medical staff to ensure that the period of withdrawal goes as safely and smoothly as possible. Alcohol withdrawal is considered a medical emergency; our alcohol detox treatment program will allow you to face and endure any or all of the above symptoms safely and with as much comfort as can be provided. Symptoms of withdrawal to begin to develop within 2 to 6 hours after stopping drinking. Usually, within 2 to 4 days the symptoms peak and are at their worst. Day 5 of abstinence from alcohol is usually the “hump” to get over. It is possible for symptoms to linger for up to 2 weeks as your body flushes out the last remnants of alcohol. Because of the severity of the withdrawal from alcohol, it is imperative that the detoxification process is not attempted alone. His House’s men’s-only rehab and detox can help you transition successfully through each phase. We will teach you how to stay sober when the going gets rough and the thought of a drink to quell the symptoms becomes an obsession. We suggest that once the stages of withdrawal have completed their course that you seek additional treatment and help. We can help you learn the tools that will aid you in living a life free from drinking. The withdrawal period from alcohol can be a very difficult time in your life. We do not believe anyone should go through this alone; alcohol detoxification should never be attempted without professional help. Some very serious and potentially life threatening side effects can occur as the result of stopping drinking. You have made a huge, empowering, and life changing decision to stop drinking. You can rest assured that His House will do everything in our power to help you meet your goals. Our staff specializes in alcohol detox treatment methods for men that have provided many others before you the knowledge and tools to help them get and stay sober. His House also offers several other treatment and therapy programs, designed for men only, including experiential therapies, Christian faith based therapies and dual diagnosis programs. You can trust our amazing staff to formulate a specific treatment plan that is tailored to your individual situation and goals. We also offer an excellent outpatient alcohol detox program. Call us today for a free assessment to determine which option is the best for you. Our goal is to help you live a sober life and regain control. This is possible! When you or someone that you love enters our facility, you can be confident in knowing that premium care and focused attention are our highest priorities. Alcohol detox centers for men are the starting point of a long and beautiful life free from the obsession to drink. You never have to drink again if you do not want to; let His House show you how to live a life free from alcohol on a daily basis.